← Paperback edition of Blue Spirit now available! 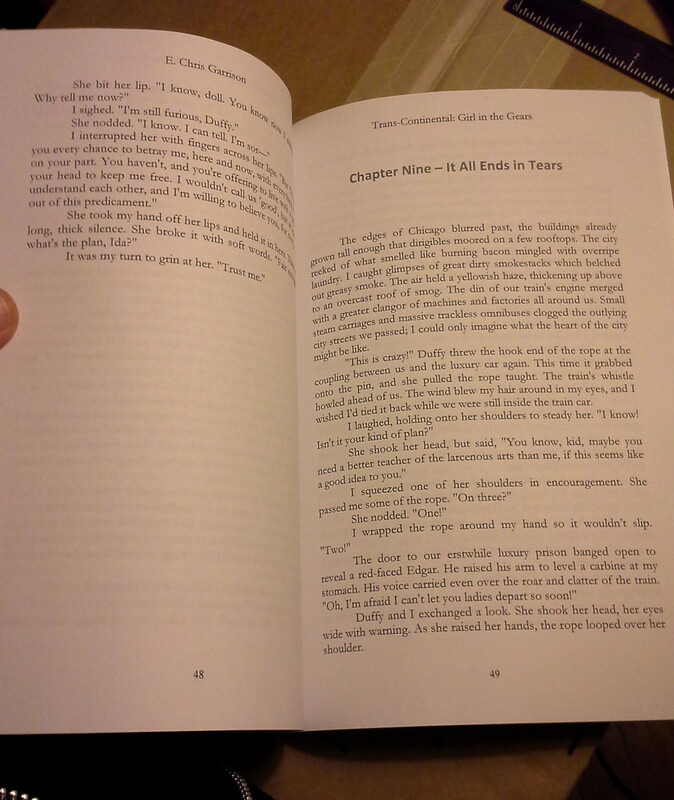 Paperback book envy: my proofs are in for Trans-Continental: Girl in the Gears & Blue Spirit! THE PROOF IS HERE! 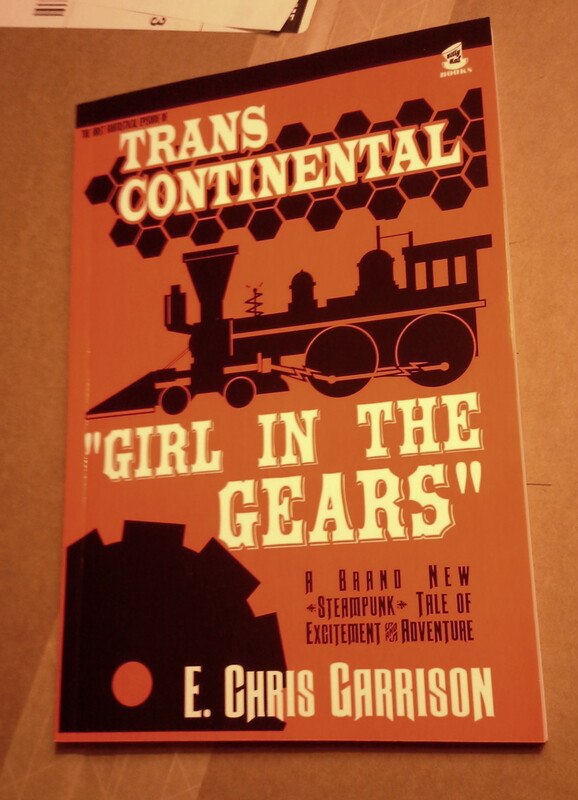 The print proof copy of Trans-Continental: Girl in the Gears arrived today! The book will be released on June 1st, in both ebook and paperback forms together, and I’m making these both very affordable. This novella makes for a thin trade paperback, but not as thin as I worried it would be. It’s over 120 pages anyway. This is how I can make these more affordable, I didn’t blow up the font or scrunch in the margins to make it thicker. And thinner books mean fewer pages, less paper, and so it is “greener”, not wasting paper that way. 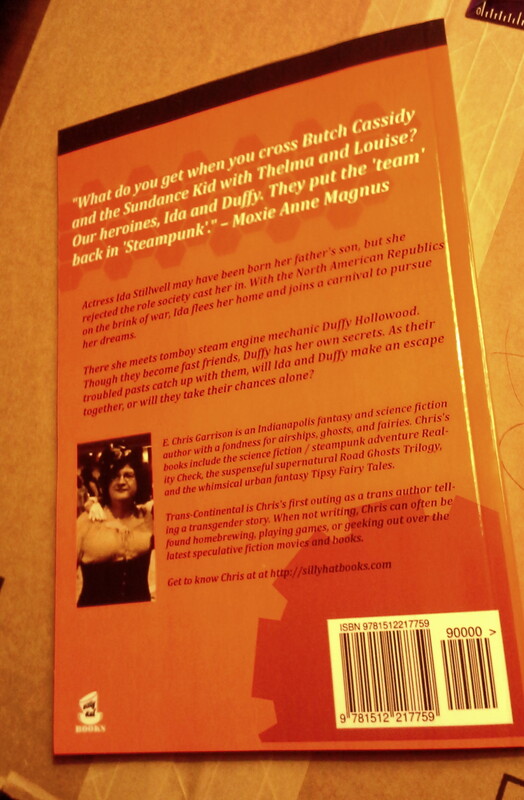 The back cover is looking good too (also much redder in real life than it appears here). Here’s the interior, and a bit of a tease if you want to squint and get yourself some spoilers. So far, there’s only one tiny correction I need to make, and then I will be able to order a big batch of these to sell in person! 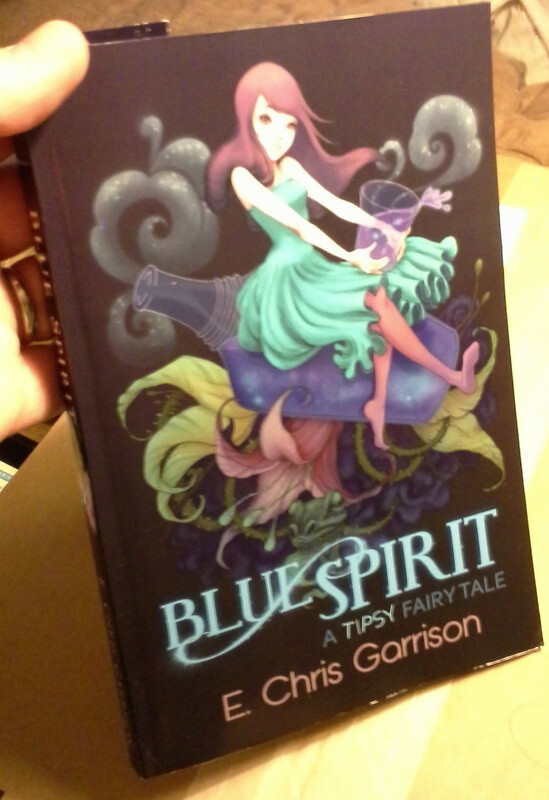 Oh yes, I didn’t mention that this came on Monday, but here is the gorgeous Blue Spirit proof. I’ve already put in an order of these to sell at summer conventions! I’m really thrilled, you guys. I hope you are too! This entry was posted in Fun Stuff, Publishing, Seventh Star Press, Silly Hat Books and tagged blue spirit, cover reveal, fairy tales, Girl in the Gears, paranormal, science fiction, steampunk, tipsy fairy tales, Trans-Continental, transgender, urban fantasy. Bookmark the permalink. 2 Responses to Paperback book envy: my proofs are in for Trans-Continental: Girl in the Gears & Blue Spirit! OMG OMG OMG! This is too much awesome for one post. I’ve never been this excited!!! !